How did this dreadful plant ever get its own page? 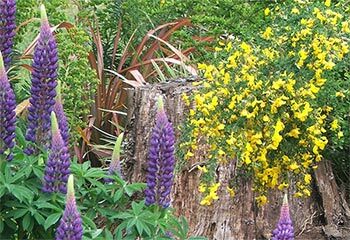 This prickly pest with such beautiful yellow flowers, here in the shrubs section? Hmm... Gorse a shrub? It's a complete and utter pest in New Zealand - brought here on the first settlers' ships, to remind them of 'home''. Unfortunately the settler gorse plants liked New Zealand so much that they went forth and multiplied, and now acres of tussock land and grassland are thus covered. 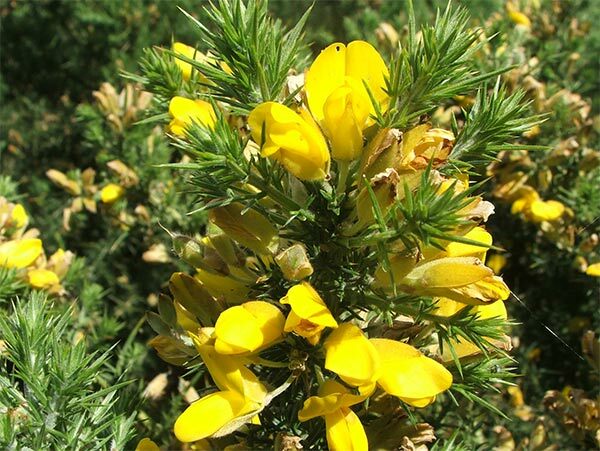 Gorse is a thorny bully - a complete nuisance. It produces huge numbers of seedlings, and can survive the fiercest fires - and the nastiest chemicals. And yet this invader has its uses. Using the adage 'If you can't beat them, join them', some land-owners allow gorse to be a nurse plant when re-establishing native New Zealand forest species. In the area where I garden, old gorse hedges are common, planted along the water race decades ago. Here at Moosey's we ripped our gorse hedge out eight years ago, burning all the evidence. Each month I weed out a thousand robust survivor seedlings - well, it certainly feels that many! And sometimes I miss one, which grows in secret, then bursts out shamelessly into shrub-sized pieces. Aargh! Where are my thick gauntlet gardening gloves? My saw? My secateurs? A friend has a terribly serious pruning book (from the USA) which includes a page on pruning gorse. Pruning gorse! Aargh!